Bill and Sharlane Clattenburg as representatives of the Deep South Peruvian Horse Club donated $11,000.00 to NAPHA to use for promotional purposes. NAPHA is looking for member input on how to use these funds for breed promotional use. Look for more details in the upcoming NAPHA newsletter that will be printed & mailed to all NAPHA members. 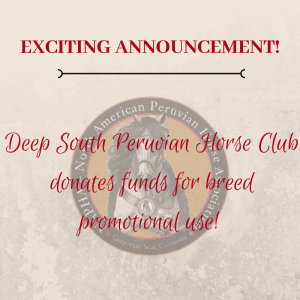 NAPHA and the NAPHA Board of Directors would like to thank you and the Deep South Peruvian Horse Club for your generous donation to NAPHA. 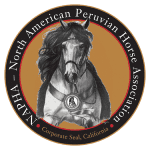 We understand the money is to be earmarked for the marketing of the Peruvian Horse and look forward to developing with the marketing committee plans to utilize the funds as you have requested. Please express our gratitude for this donation to any other individuals that you feel should know of the appreciation we hold for this donation. Again, thank you for your support of the Peruvian Horse in the United States.